Mention Stonehenge and it conjures images of stately stones standing in a sacred circle on the Wiltshire plains, or a solstice celebration at the break of dawn with dancing, sky-gazing and the imbibing of mead. There are stories of religious ceremonies, solemn burials and a small settlement. One might have similar visions of “German Stonehenge” with beer substituted for mead, but this would be dead wrong. In their cleverly named study, “The ring sanctuary of Pömmelte, Germany: a monumental, multi-layered metaphor of the late third millennium BC,” published this week in the journal Antiquity, archaeologists André Spatzier of the State Office for Cultural Heritage Management in Baden-Württemberg and François Bertemes of the Martin Luther University in Halle-Wittenberg, reveal Pömmelte, a wooden henge southwest of Berlin discovered in 1991, was the site of human sacrifice. These weren’t the gruesomely-stylized, equal-opportunity sacrifices and burials of well-trained Aztec priests either – the remains found at Pömmelte were of women and children whose skulls and ribs were fractured before their bodies were tossed without any appearance of reverence into the pit found inside one of the rings. 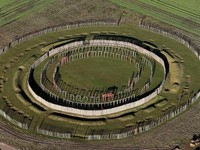 Prior research shows that Pömmelte, now a part of the town of Barby, was a henge constructed of wood with ditches and banks forming seven concentric rings. The outermost ring measured 115 feet in diameter. Radiocarbon dating of the broken ceramic drinking vessels, stone axes, millstones and animal bones places the original construction date at around 2300 BC, between the Late Neolithic and Early Bronze Ages, i.e., it is roughly the same age as Stonehenge, but much later than Germany’s 7000-year-old Goseck Circle, a more primitive structure used for astronomical observations and possibly human sacrifice, as well. In an interview with LiveScience, Spatzier described the brutal deaths of the women and children and contrasts them to the ceremonial, but still unusual burials of adult men (ages 17 to 30) found within an outer circle. The victims’ last moments must have been gruesome for it appears they were thrown, or pushed, into the pit and at least one of the teens had her hands bound. The male remains showed no evidence of violence and, rather than being tossed into a pit, were buried facing east, indicating a religious ritual and possibly their stature in society. The henge itself was designed with its openings facing points halfway between the equinoxes and the solstices, possibly symbolizing important times for farmers rather than astronomers. Because the henge was made of wood, nothing original remains at Pömmelte. In fact, it appears the structure was intentionally destroyed somewhere around 2050 BC – the postholes were used as shafts to store broken artifacts, an inner circle was filled with the ashes of burnt poles and soil was used to cover the ditches. The site still had some meaning to the locals – one male skeleton found appears to have been moved from another site and buried in 1900 BC. It remains unclear whether the individuals interred at Pömmelte were ritually killed or if their deaths resulted from intergroup conflict, such as raiding. Why were the women and children brutally sacrificed and their bodies dumped into shafts? Additional research is necessary, particularly because odd burials were discovered at other German henge sites. Also, the historical link between the wooden henges of Germany and the stone rings of Britain needs to be studied. The more we learn about these ancient henges, the more we may learn about ourselves though the answers aren’t always pretty. Source: Paul Seaburn, Mysterious Universe, June 30, 2018. All of these people today who call themselves pagan and say that pagans were peaceful, animal-loving vegetarians don't know what they're talking about. All of the pagans that I've ever read about, like the Celts, were blood-thirsty. The Celts cut people's heads off and collected them as trophies.